Designate one member of the crew to act as a signaller. 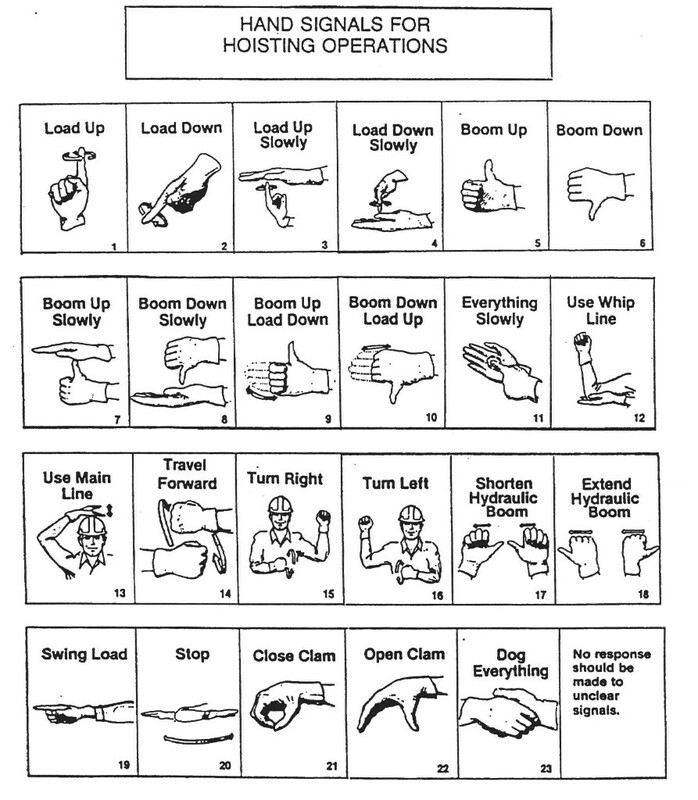 Instruct the equipment operator to recognize signals from that person only. Identify signaller to the crew. Inspect all lifting devices and rigging for damage before hooking up. Frayed chokers or slings must not be used and should be destroyed when found. Check site for overhead power lines and other hazards. Set up appropriate controls. Use slings of proper length. Never shorten slings by twisting, knotting, or by using nuts and bolts on chain slings. Place slings or chokers so load is balanced. Hoist or crane hook should be directly over the balance point. Once the chokers or slings have been positioned, get clear of the load before giving the “all ready” signal. If the slings or chokers must be held in position, ensure all hands are clear of pinch points before giving the “all ready” signal. Hold slings or chokers in position only until tension is enough to keep them in place, then get clear of load before hoisting. Keep bystanders out of the work area. Never permit anyone to ride the load or lifting hook. Anticipate the load swing or roll and position yourself so as not to be struck or pinned by the load. Tag lines should be used to control the load whenever possible. Never place yourself between the load and a stationary object. Never stand under the load or boom. Remain clear of stacked material that could be struck by the load. Remove any unnecessary blocks or objects in the area where the load is to be set down. Place blocking so the slings can be easily removed. Keep your feet and other body parts out from under the load when lowering or setting down. Lower the load slowly to control the load when placing. Remove the chokers or slings form the load when placing. Remove the chokers or slings from the load after the tension has been removed from the lines.